As requested in another thread, some M4C members asked me to post pictures of the Holloway Arms HAC 7. I’m not going to talk about the history of the HAC 7, nor the story of Bob Holloway. I’m also not going to get into all the specific models (title 1, Class 3, left and right hand versions, sniper, battle rifle or carbine). I will only focus on the best features that make the weapon SO unique. A couple years back, I had the privilege of meeting Bob, and for those of you that are interested, he is doing well. 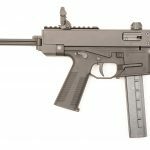 Even though he doesn’t currently work in the firearm industry, his dream is to get back into the industry and continue developing great product. For now, he’s happy with what he’s doing and I personally look forward to seeing what he has to offer. Now onto the HAC 7….. I personally love the HAC 7. I first saw ads back in the Mid-80’s in Gung Ho or Firepower magazine. I’ve been following the weapon’s history and hoped and prayed I could get one someday. I was finally able to get one (a very early model) with the serial number range in the “twenties”. Seeing that only a few hundred we manufactured, the construction was crude but simple. Holloway developed the weapon for ease of manufacturing, while retaining simple ergonomics. 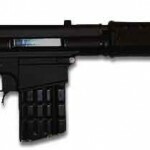 Most of the weapon is constructed of aluminum and the fore-end and grip are injection molded plastic (too hard to be Nylon, but it could be). What makes this weapon so unique is the action. 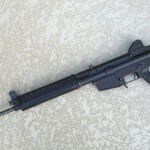 Holloway married up the design of the long-stroke piston and a semi-direct gas impingement (gas tube) design. Of course this design was mainly developed to lessen barrel whip, which occurs on most piston systems and also lessen the weight over the barrel. 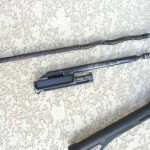 As seen in the pictures below, the shorty piston looks similar to one found in an AKSU-74 (Krink). The gas tube is short and free-floating. With this combination, not only does it lessen muzzle weight and increase accuracy, but it also eliminates the gases from going into the upper receiver. 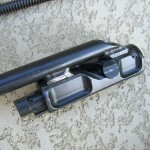 Just in front of the upper receiver, under the handguard, the piston guide tube has gas venting ports. The major benefit of the HAC is the long dwell time in the action. Longer dwell time, usually means less felt recoil. For being light weight, the HAC7 is one of the smoothest shooting battle rifles ever made in the .308 Winchester cartridge. I always thought the Portuguese NATO AR-10 or the BM59 (with its Tri-comp compensator system) was the most controllable battle rifle made, until shooting the HAC. 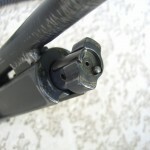 The HAC use a two-lug rotating bolt, but with a Stoner style cam-pin design. The bolt rotates 60-degrees (counter-clockwise) like a Stoner system. 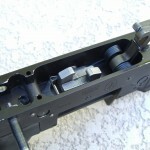 Due to its 60-degree rotation, the cam slot is very long, giving it its extended dwell time, but also giving it extremely long upper and lower receiver length. Another ingenious design Holloway came up with is the use of the “cartridge bearing plate”. This plate cycles with the bolt, in and out of the carrier. 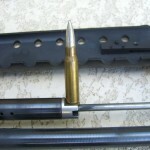 Its primary goal is to supply even force and form over the waiting cartridges in the magazine. 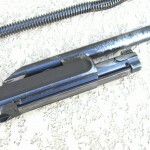 With the extended dwell time, the bolt head would protrude from the bolt carrier, making an unsupported distance between the bolt head and carrier. Without the plate, this void would probably increase malfunctions and/or damage the cartridge as it loads into the chamber. The Cartridge Bearing Plate is the cleverest way to allow a smooth transfer over the waiting cartridges. The rest of the carrier group is simple, but well executed. The ejector is spring loaded (i.e. 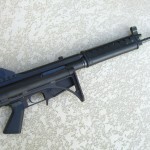 Stoner), the extractor uses a plunger and spring, like the M14, M60, AK74 etc. 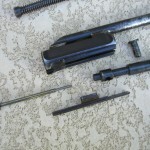 The firing pin resembles one found in an early AR10, and the firing pin retainer is a captive plunger, that can’t accidentally be lost. The lower receiver group is extremely simple. 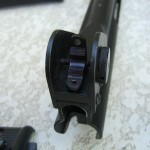 The fire control group is a simple re-design of Browning’s double-hook design. 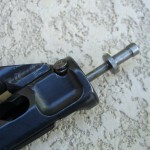 The trigger and hammer pin location is almost identical to the AK. 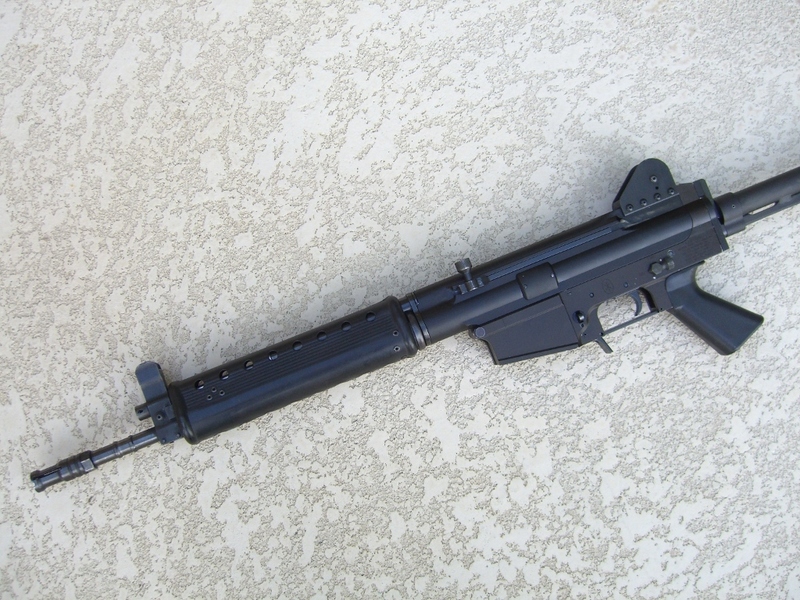 Even though they are similar, no other pre-existing weapons components were used on the HAC 7, except for a modified AR10 magazine. 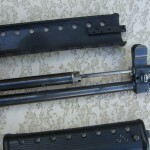 Holloway used an AK-style centered magazine release, which unfortunately means the AR10 magazine needed modification, a notch on the back strap, to latch in the magazine well. 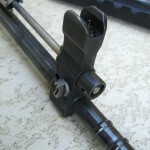 Another unique feature is the “shaft” or FAL style bolt-catch. Holloway used two different designs during production, but majority of the production models had a late-model/simpler design. Pictured in this thread is the early model configuration. The barrel cluster is also similar to the Stoner/Johnson design, meaning it utilizes a threaded-on barrel extension. 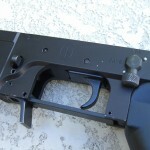 One unique feature is that barrel assembly is loaded in to the upper receiver from the back side. After the barrel is slid into place and indexed with the gas piston guide tube, a barrel nut is used to lock everything into place. The gas block offers two different valving functions; one is a “pull and rotate” knob-type gas adjustment and the other is a gas shut-off valve. 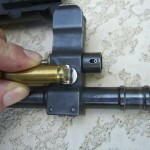 The shut-off valve is used for barrel mounted spigot grenades. The shut-off valve and other HAC components can be adjusted and disassembled with the use of a cartridge. 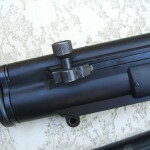 Some examples are the mentioned shut-off valve and the gas tube retaining plug, which can be disassembled with the rim of a .308Win casing. All in all, the weapon is just full of neat and simple ideas. If Holloway had the time, money and resources to finish the weapon, the way he wanted to, then HAC 7 would probably be a major player today. There are no new ideas in the firearms world, just improved plagiarism. As long as it’s legal, all of the modern designers have and will do it. Sometimes though, there comes along some clever guy, like Robert Holloway, that can add his neat twist to things that show to be a major improvement over existing designs. If it was up to me, I’d bring back an improved HAC 7, probably the way Holloway would want to see it become. More information can be found in the responses in the thread. We've started a Holloway Arms Co. Model 7 (HAC-7) registry ..
GunDoll showing a field strip of a rare Holloway Arms .. 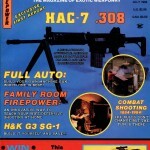 In 1984 Firepower "A Magazine of Exotic Weaponry" had an ..
Pingback: What kind of gun is this?